The sun has been shining for several days now – hooray! 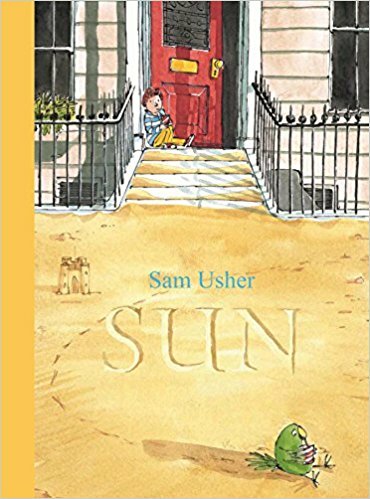 Summer is hopefully here to stay and Sun is the perfect picture book to enjoy in this beautiful weather! Its sparkly, predominantly yellow cover invites you in whether you’re also basking in the sunshine or looking to add sunshine to your life on a gloomier day. The Story: On the hottest day of the year a boy and his grandfather decide to go on an adventure. They pack provisions and set off to find the perfect picnic spot. It gets hotter and hotter so they try and find a shady spot with a cool breeze. Eventually they find the perfect picnic place but somebody has got there first! 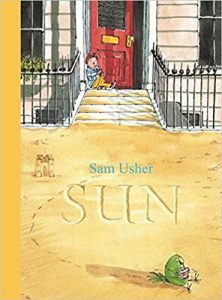 The sunshine sizzles off every page in Sun which celebrates the relationship between a boy and his grandfather and their enjoyment of a day out together. 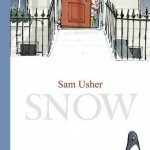 They delight in each others’ company and Sam Usher has effortlessly managed to show the fact that despite their age differences, while grandpa stops several time for a rest the boy enthusiastically navigates, the two can both enjoy their day of adventure. A wonderful surprise awaits them when they find a cave full of pirates to picnic with and we love the double spread which shows Grandpa and the boy joining the pirates on their ship. Written in the first person the text is easy to read and features simple repetition. 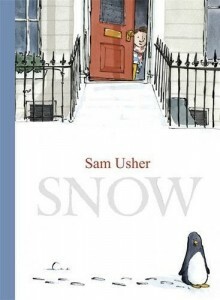 The cover mirrors the covers from Sam Usher’s Snow and Rain stories which show the boy yearning to go outside, all of the picture books are celebrations of the simple pleasures that can be gained from being outside during different weather. Sam’s illustrations are beautiful and I love the full spreads showing grandpa and the boy walking for miles, the colour of the sky changes as the day gets hotter, my favourite shows a burning red sky. My daughter loves the spread showing the provisions, there are lots of snacks, useful items like a torch and compass as well as soft toys dressed as pirates which provide a hint of the adventure to come and add to the fantasy – did the boy and grandpa really meet pirates or have they both got really great imaginations? We hope that this wonderful story will inspire children and their grandfathers to have their own adventures! Sam Usher visited Story Snug to tell us how he created the pirate ship illustration. It’s a fascinating blogpost which shows just how much time and work goes into just one picture book double spread! Children with grandfathers will hopefully be able to relate to the story and may even be inspired to have their own adventures! This looks like a lovely book. It sounds like it has a beautiful story and lovely illustrations. This sounds beautiful. Would be a great one for my nephew as he has a lovely relationship with my dad. Hi Carol, part of the joy of reading children’s books are the illustrations. A good illustration really adds to the story and makes it more fun. 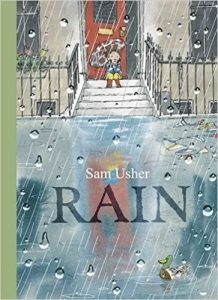 This book sounds perfect for getting imaginations working overtime, in both children and adults.